Premier Wen Jiabao gave a press conference after the conclusion of the third session of the 10th National People's Congress in Beijing on March 14, and talked a wide range of issues, from economy to foreign policy, and from the newly adopted Anti-secession Law to stock market. He said that China would have no letup in its efforts of macro economic control, which has contributed to the country's steady and rapid economic growth and stabilization of market prices over the past year. "The top priority for the government is to further strengthen and improve macro-regulative policy and measures in order to maintain a steady and fairly rapid economic growth," said Wen. "We must not stop and we must not waste our previous efforts." Citing problems such as greater difficulties in raising grain output and farmers' income and a serious strain of energy supply and transportation capacity, Wen conceded that China is now faced with "many dilemmas" in its "overstretched" economy. He pointed out that these problems were actually problems with the economic growth mode and institutional problems, and therefore would "take time to be addressed". He also promised that his government would "give different treatment to different situations" in its macro-control efforts, adding that "we must take both administrative and economic means to achieve macro-regulative objectives". The Premier said that China will never allow any foreign interference with the Taiwan issue, and it is not afraid of any such interference should it occur. Taiwan issue is entirely an internal issue of China and solving the Taiwan issue "subjects to no interference by any outside forces," Wen said. "We are not willing to see that any foreign interference would occur, but we are not afraid of any interference should it occur,"Wen said. Wen said the ten-article Anti-Secession Law is not targeted against Taiwan compatriots, but opposing and checking "Taiwan independence" secessionist activities. "It is not a law of war but one for the peaceful reunification of the motherland," he said. "It is not a law intended to change the status quo that both sides of the Taiwan Straits belong to one China, but one conducive to peace and stability across the Taiwan Straits." The Taiwan issue is one left over from China's civil war of the late 1940s. Wen stressed that although the mainland and Taiwan are yet to be reunified, that does not change the fact there is only one China in the world. The premier said China is unwilling to see such circumstance to occur. "So long as there is a glimmer of hope for peaceful reunification, we will exert our utmost to make it happen rather than give it up," he said. The purpose of making such a law, Wen said, is to demonstrate "the common will and strong resolve" of the entire Chinese people, the 23 million Taiwan compatriots included, to safeguard China's sovereignty and territorial integrity and never to allow the "Taiwan independence" forces to make Taiwan secede from China. Wen cited two US laws against secession made in 1861 before the Civil War of the United States, which have similar contents as China's. Wen also hoped that all Taiwan compatriots would understand the purpose of the legislation, and that nations and people who uphold the one-China policy and wish peace and stability across the Taiwan Straits would understand and support the law. On the issue of China's national defense, Wen said China exercises a defense-oriented policy, and its national defense expenditure cannot compare with that of the United States. "I want to clarify a fact that over the past hundred years, China has always been bullied by others," he said. "China has never sent a single soldier to occupy even an inch of foreign land." 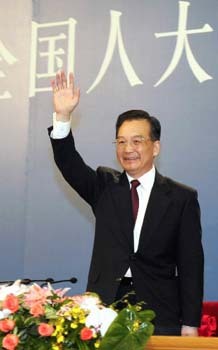 Premier Wen comfirmed that the farmers' rights to manage and use their land will not change in the long run, or "forever." According to him, the country's reform started in rural areas, to be more specific, from readjusting the right to "manage and use land",and a household contract responsibility system for farm production was established in the late 1970s, allowing farmers to utilize their land in due course. "Their rights have been continuously extended," said Wen, reaffirming that rural land is under collective ownership in China. As for rural reform and development, the Premier said that it has entered its second phase, with industry expected to nurture agriculture and cities to support rural areas. "We should give more, take less and further liberalize the rural productivity," Wen said. He listed four jobs as the central tasks for the second phase. Firstly, efforts should be made to promote rural reforms with focus on rural tax and administrative fee reform. Secondly, productivity in the rural areas should be improved by building more water conservation projects and promoting wider application of agriculture-related science and technologies. Thirdly, "we should also further develop education, science and technology, culture as well as other social undertakings in the rural areas," Wen said. And finally, grass-roots democracy should be promoted by enhancing the ability of self-governance among villagers, implementing direct election at the village level and giving greater transparency in administration affairs at the village and county level, he added. In the first phase for rural reform and development, China has introduced to the rural areas the family contract responsibility system, which has granted farmers greater autonomy in land use, production and management. "As a result, it has greatly liberalized productivity in the rural areas," Wen said. On the question concerning yuan's rate, Premier Wen said that China is working on a plan for a more flexible exchange rate of its currency, but the specific measures might come around unexpected. China started to reform its exchange rate in 1994 and the work has never stopped. The purpose is to establish a market-based, managed and floating exchange rate, Wen said. China is doing now is to lay a solid foundation for such a reform. The necessary prerequisites for the reform include, first, macroeconomic stability and growth and second, a healthy financial situation, Wen added. Meanwhile, said Wen, China has already taken a series of measures to ease foreign exchange regulation. There has been no agreement on what impacts the change of China's exchange rate, or the appreciation of Renminbi, will have on the Chinese economy, Chinese enterprises and neighboring countries and other countries in the world. Although some people strongly ask for the appreciation of Renminbi, they don't fully understand the problems arising from the appreciation, Wen said. China is a responsible country. On the issue of the appreciation of Renminbi and the exchange rate system, China not only considers the domestic interests, but also its possible impacts on neighboring countries and the world, he said. Answering question concerning Mr. Tung Chee Hwa's resignation, Premier Wen said that Tung's resignation has been "out of his own sincere will", and his contributions to Hong Kong will be remembered by the Hong Kong people and treated fairly by history. Tung's proposal to resign from the post would win understanding from the Hong Kong people and would be respected by the Central Government. Wen said that he believes that the Hong Kong people are fully capable of running Hong Kong well and the central government will unswervingly stick to the principle of "one country, two systems" and "the Hong Kong people governing Hong Kong" and "a high degree of autonomy". The election of a new chief executive of the Hong Kong Special Administrative Region (HKSAR) will be done fully in accordance with the Basic Law and other laws, he said. "The central government will always strictly follow the Basic Law," Wen added. Despite the Asian financial crisis, Hong Kong's economy has picked up and living standard of its people has further been improved, Wen said. "Over the seven and more years, Mr. Tung has done a tremendous and creative job," "He was hardworking with few complaints and showed his strong sense of responsibility," Wen said. Commenting on the issue of bilateral ties between China and Japan, the Premier said China and Japan should make joint efforts to create conditions for high-level exchange of visits in a bid to improve bilateral relations. He also suggested the foreign affairs departments of the two countries should begin strategic study and research on strengthening and improving China-Japan relations. And problems left over from history should be properly handled. Since the normalization of bilateral relationship, the China-Japan relations have made great progress. Last year, bilateral trade approached to 170 billion US dollars and the number of bilateral personnel visits exceeded four million. However, there are obstacles to China-Japan relations. They are particularly in the political sector and the fundamental issueis how the Japanese side views correctly the issues left over from history, the Premier said. First, taking history as a mirror and looking forward into the future. The year of 2005 marked the 60th anniversary of the victory on the War of Resistance Against Japanese Aggression won by the Chinese people. It reminded us untold sufferings of the Chinese people, Asian people and even Japanese people at that time. Therefore, "We hope that the Japanese government could take opportunities to promote friendship between the two countries." Second, the Japanese government should stick to the "one China" principle. The Japan-America security alliance is a bilateral arrangement. The Chinese people are concerned with the alliance, because it is related to the Taiwan issue, which is China's internal affair and never allows any direct or indirect interference by any other countries. Third, strengthening cooperation and pursuing common development. There are tremendous potentials in China-Japan friendly cooperation, especially in the economy and trade sectors,Wen said. The year 2005 is not only a year of reform, but a year of "fight a nut-cracking battle" in reform, Premier Wen Jiabao said. To remove the unhealthy and destabilizing factors in the economy and strengthen the achievements of macroregulation hinges on reform, he said. To solve the deeply-rooted "contradictions and problems" in the economic development, adjust the industrial structure and change the patterns of economic growth relies on reform, the premier said. Wen said that to realize social fairness and justice and build a harmonious society also needs reform. China's reform cannot be done in just one year, but is a long-term target. It would be better to solve some problems at an earlier date, or they will be accumulated to a level hard to solve,Wen warned. -- To advance social security reform. 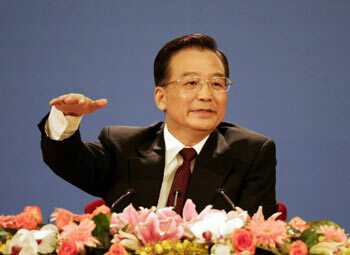 Premier Wen Jiabao announced that he will pay a visit to India soon at the invitation of his Indian counterpart. When commenting bilateral relations between China and India, he said, as the two most populous nations in the world, China and India are not rivals but friends, and that both countries shall work together to tap the potential of bilateral cooperation and find a "fair, reasonable and mutually acceptable plan" to solve their border disputes. 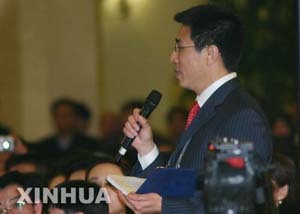 "I hope you can send my message back to the great Indian people,that we're not competitors, we are friends," said Wen. Acknowledging that China and India will celebrate next month the 55th anniversary of the establishment of their diplomatic ties, Wen expressed the hope that the anniversary would "become a new starting point for Sino-Indian friendly cooperation". Stating that the development of Sino-Indian relations has "entered a new stage" in recent years, Wen said that during his planned visit, he would seek consensus mainly on three issues with his Indian hosts. "Both China and India should fully recognize the great significance of Sino-Indian friendship, not only to Asia, but alsoto the entire world," said Wen. Though the annual trade volume between the two countries has now reached 13.6 billion US dollars, there remains great potentials for the two sides to expand cooperation and seek common development, he added. On the sensitive boundary issue, the premier suggested that the two countries first establish the principle for the resolution of the issue, which was left over by history, on the basis of equal consultation and mutual understanding and accommodation with both respect for history and accommodation for reality. The premier gave an emotional ending to his comments by quotingfrom an ancient Indian poem: "May we not hate anyone. Let there be peace, let there be peace, let there be peace!" On the issue concerning China's economic ties with Russia, the Premier said China-Russia energy cooperation is an important part of the bilateral cooperative friendship and is based on equality and mutual benefit. He said he would discuss with his Russian counterpart Mikhail Fradkov about trade and economic cooperation, particularly that in oil and gas exploration, when they met in the second half of the year. China and Russia have reached a consensus on energy cooperation, Wen said, citing Russia's promise to enlarge oil export to China to 10 million tons for 2005 and 15 million tons for 2006, based on last year's 9 million tons. Russian President Vladimir Putin has made it clear that Russia would give first consideration to China in building an oil-gas pipeline in Siberia. Describing the China-Russia relationship over the last few years as being in "the best period" since the settlement of the border issues left over from history, Wen said the two countries had set a goal to expand their trade to 60-80 million US dollars by 2010. Last year, China and Russia established a strategic partnership of cooperation and their trade reached 20 billion US dollars. On the question of death penalty, the Premier confirmed that measures are being taken to reform the country's judicial system including the possible callback of the power to approve death penalty to the Supreme People's Court. However, based on China's "national conditions", it is impossible for China to rescind the sentence term, said Wen, citing the fact that half of the nations worldwide still adopt the death penalty to support his comment. The Premier also vowed to improve judicial mechanism to ensure "death penalty to be given carefully and fairly". Answering the question on stock market develpment, Premier Wen said China will continue its policy of developing the capital market and expand direct financing. He listed some specific measures to achieve that goal, including enhancing efforts to improve the quality of listed firms,which he said is "fundamental" to the country's endeavors in developing the securities market. The country will also build an open, fair and transparent securities market, intensify supervision and crack down on any behaviors in violation of laws and regulations, he added.